The Friends regularly hold informative walks, carry out sustainable conservation and restorative work and monitor wildlife in Selsdon Wood. On our work days (see the Workdays page for details) we coppice woodland and carry out other maintenance work. Our Committee meetings are open to all, usually on the last Monday of alternate months - see below for the next meeting. We hold our AGM in early March - see Events page for details. Meetings start at 8pm at the Forestdale Forum. To join please complete and submit the form which can be found at the bottom of the Contact Us page on this website. Alternatively contact our Membership Officer, David Malins, at davidmalins@btinternet.com for information. This is another of those unusual years in which the bluebells and the anemones are out together - see banner photograph. 17/4/19 - The bluebells are a week or so off their peak but the anemones are still at their height. Over the Easter weekend the woods will be looking splendid!!! Our next workday is on Sunday 5th May - see Workdays page for details. Our next Meeting is on Monday 20th May 2019 @ 8pm at the Forestdale Forum. All members welcome. Next time you visit the wood take a look in the lost property box on the back of the notice board by the car park - there may be something of yours in there. Currently contents include a mixed bag of hats, dog leads, pedometer, earrings, sunglasses etc. Please retrieve anything that is yours. The box also contained a key which we have removed for safe keeping. It has a distinctive blue ID tag, a bottle opener and a stitched mascot on the key ring. Do contact the FSW if you recognise this description. From time to time FSW seeks additional funding from organisations interested in supporting the various activities undertaken on behalf of the Friends. We are grateful to Croydon Council, through their Nature Conservation Fund, for providing funding to cover Insurance costs and helping us to buy new tools for Workdays. In 2014 the Friends undertook repair of the six noticeboards, with new art work describing the habitat and an updated map. Croydon Council, through the Small Grants Fund, provided funding towards this project, as did the Selsdon Residents Association. Without this significant contribution this project could not have been undertaken. In 2016 we made major repairs to the muddy paths with the gravel and woodchip for this work funded partly through sponsorship. We are grateful to Councillor Sara Bashford for a contribution from her Community Budget and also to Woodside Timber and Spring Lane Builders Merchants for their donation and discounts. See the projects page for further details. If you are interested in sponsoring the work of the Friends, please contact Heather Govier, Chair of Selsdon Wood at govierh@gmail.com. We will be delighted to publicise sponsorship to all our 250 members through our newsletters and more widely through our contributions to local publications. Jan-4.30: Feb-5.30: Mar-6.30: Apr-8.00: May-9.00: June/July-9.30: Aug-8.30: Sept-7.30: Oct-6.30: Nov/Dec-4.30. For fire, ambulance or illegal activities where immediate response is required - call 999. Our name boards will help you give the location. Alternatively if you ring 112 from a mobile phone it will automatically give your GPS position to the emergency services. For non urgent matters, such as motorbikes or quads (which are prohibited and could be dangerous) or other antisocial behaviour please ring 101 or contact the Safer Neighbourhoods Team at Addington Police Station on 020-8721-2464 or email Selsdon.Ballards.snt@met.police.uk. If you are able to photograph the miscreants that would be very helpful. For Injured wildlife call RSPCA 0300 1234 999 (24/7). For problems requiring a mechanical solution - such as deer trapped in fences - phone the Fire Brigade on the 101 or 112 number. There have been a number of incidents in the area of animals - cats and dogs as well as wild animals such as birds, rabbits and foxes - being deliberately killed and mutilated. This should be reported to the police and also to SNARL http://snarl.org.uk South Norwood Animal Rescue and Liberty tel: 07961 030064 or 07957 830490. We would also be grateful if you would tell the FSW about any problems - e-mail: selsdonwood@gmail.com or use the Contact Us page on this website. 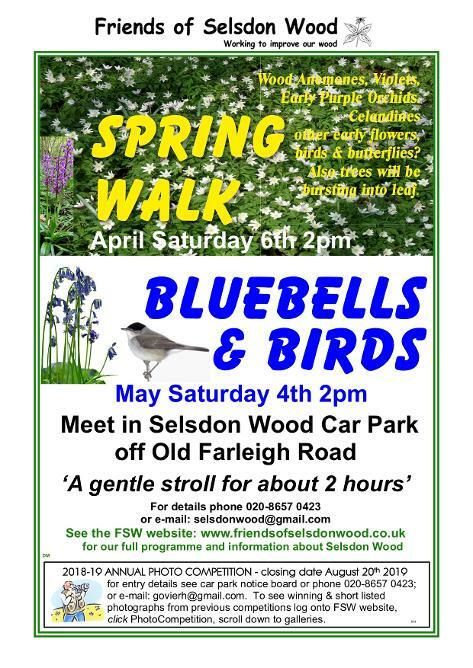 The Selsdon Wood car park is off Old Farleigh Road, Croydon, CR2 8QF. There is an additional hourly bus, 409, which runs along Old Farleigh Road with a stop named Selsdon Nature Reserve and It is also possible to access the wood from Courtwood Lane which is served by the 353. Chalara (Ash Dieback - a disease of Ash trees ) was found in 2016 in the Council coppice blocks in Selsdon Wood. Unfortunately this was inevitable with the infection being found at Warlingham two years previously. Whilst it is not ideal, current thinking is to carry on as normal as there is a good level of resistance being found in the UK and fatality is not necessarily going to occur for infected trees.